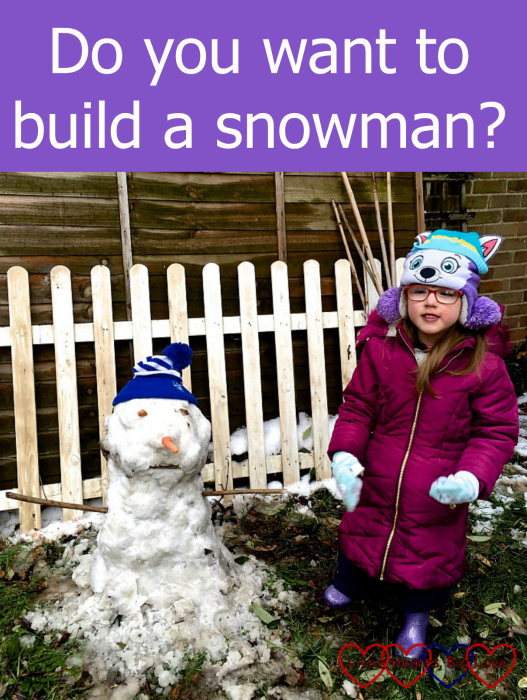 The recent snow we had was too powdery to be good for building a snowman. We made the most of it in other ways though. When it finally started to melt last weekend, I thought we might have better luck as the snow was a little wetter. We had to be quick though as the snow was melting fast! Jessica and Sophie were initially keen to help me roll a couple of big snowballs to make the snowman. We gathered up most of what was left in the garden. 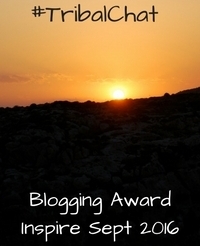 It made for quite grubby snowballs though as the garden was quite muddy. Thankfully there was still some fairly clean snow left on top of the fence panels that were waiting for the thaw to be put up. I collected as much of the clean snow as I could in a trug. It was perfect for covering up the big muddy snowballs and making the snowman a little bigger. The girls weren’t quite as keen on building a snowman as I was though! They were having more fun making footprints in the snow on the path. 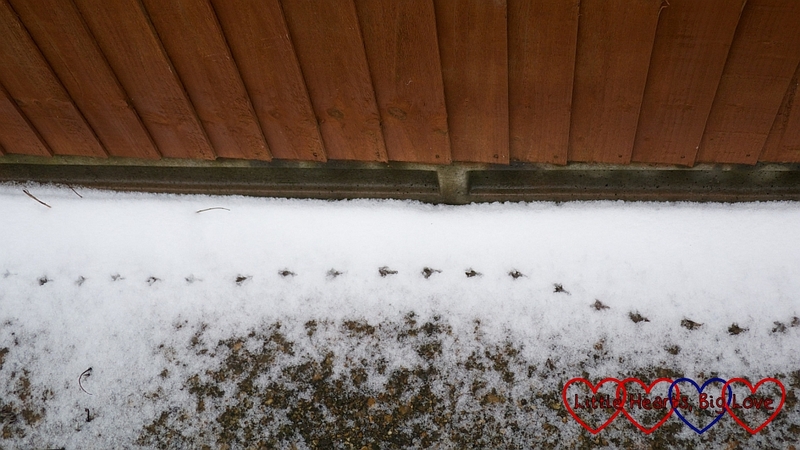 Sophie also spotted some bird footprints by the fence. Once the snowman was nearly finished, they became a bit more interested. Sophie helped me find some sticks for his arms and some stones for his eyes. Both the girls were quite happy to pose with Mr Snowman once he was finished! It was just as well we grabbed the opportunity to build the snowman as an hour later, most of the snow had melted away. Our snowman did manage to hang on for a day or so before he melted away too. Thanks Anne – it was lovely to get to build one even if he didn’t last long! It’s great that you got the girls out building snowmen with you, definitely an activity that needs to be done whenever the chance arises. The fact that the girls went off and did their own thing whilst you were building the snowman made me chuckle, at least they were having fun in the snow together. 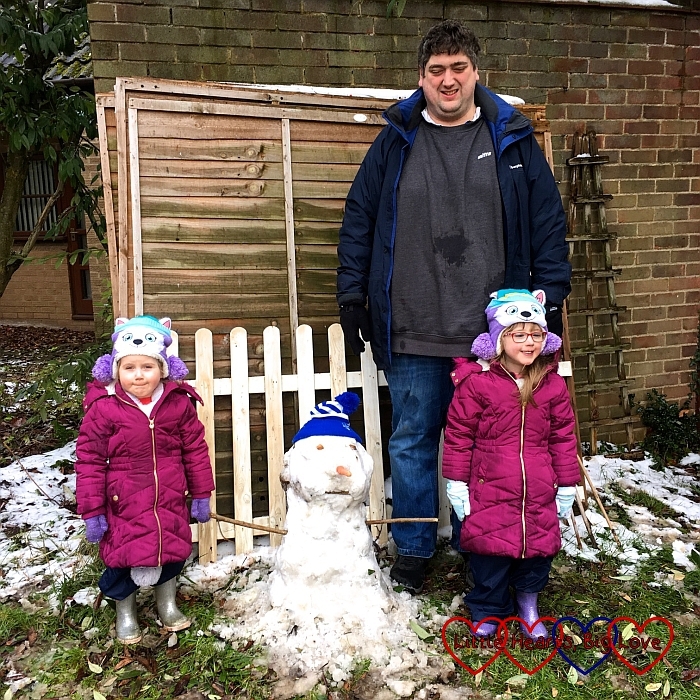 I love the shot of the girls and your husband stood with your snowman, clearly the perfect use of the final days of snow. As much as it snowed the snow was rubbish here for building a snowman. Yours looks great! 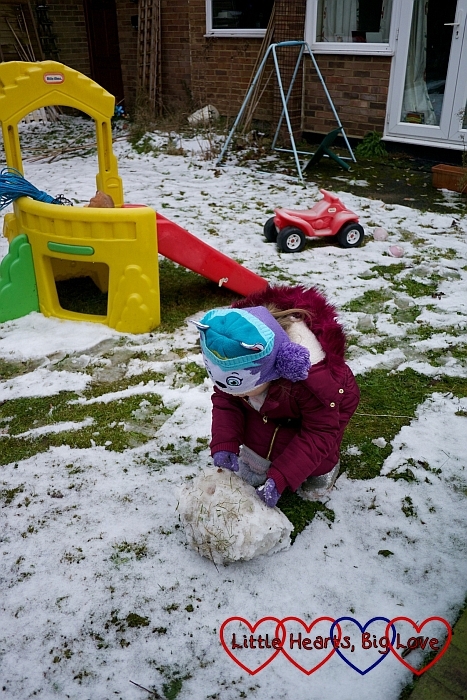 Thanks Kim, our snow was rubbish for snowman building too until just before it melted. Oh this has made me laugh, so funny that you were more keen than they were! Lovely photo and I’m sure you’ll look back on it in the future and they’ll remember making it with you. Lol, yes it was definitely mostly me that wanted to make the snowman! Good bit of team work there!